It’s incredible how quickly time passes. One minute, you’re pet-proofing your yard. Wasn’t it just yesterday that you installed the ramp in the bedroom to help your aging pet get on the bed? Pets are our family, and they bring us countless joyful moments and leave us with cherished, irreplaceable memories when they go. So, when it’s time to say goodbye to your furry friend, you naturally want to honor their lives in the same way you would a human loved one. The good news is that there are some ways you can ensure your dog, cat, or another breed of pet’s memory will live on long after they cross the Rainbow Bridge. Whether you’re considering cremation or burial for your four-legged family member, here are the logistical and legal considerations you should be aware of as you plan. When most people think of a pet’s passing, the image of a grief-stricken family digging a backyard grave comes to mind. There’s a good reason for that. Keeping pets close to home after they pass on is a practical and peaceful way to keep them close to your heart. Burying your pet yourself can help you achieve closure. Being able to visit the spot where your little loved-one rests can ease your transition into life without your trusted companion. However uncomplicated a backyard burial seems, there are a few things you should be aware of, including applicable state and local laws that dictate burial requirements. In smaller towns and more rural areas, you can usually bury your pet without restriction on private property, as long as you own it or the owner grants his or her permission. In other locations, whether you may or may not bury your pet, even on your property, will depend on your HOA, the soil, proximity to water sources, and property lines. Rules may also apply to the minimum depth of the grave itself, grave markers, and burial containers. These rules are put in place to protect the environment, as well as humans and wildlife, from disease and contamination as your pet’s body decomposes and returns to the earth. Location – Bury your pet close enough to your home that you can visit whenever you wish to, but far enough away that it won’t be a constant reminder of your loss. Consider your pet’s favorite spots on your property as well as those of your family. Depth – Ideally, a pet’s grave should be three to four feet deep to protect the remains from scavengers. Many pet owners feel compelled to dig it by hand, but you can certainly use heavy equipment if you have it. Container – You may wrap your pet in his or her favorite blanket, bury them in their bed, or simply place them in the earth as they are. Pet coffins, typically made of cardboard, wicker, or wood, are also available for purchase. Whatever you choose, ensure it is biodegradable. 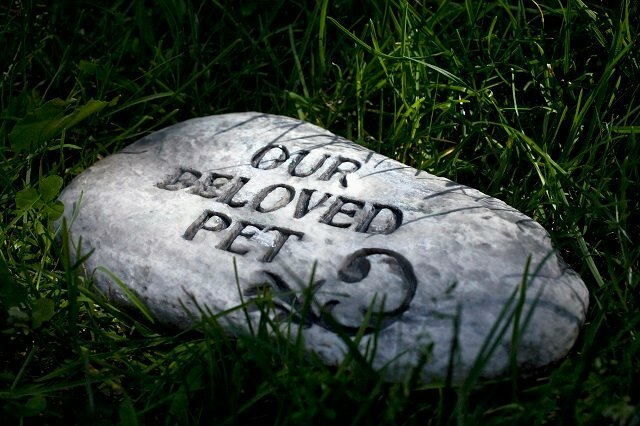 Marker – You can mark your pet’s grave naturally with flowers, rocks, or a shrub. If you want something more formal, you can order a custom grave marker with your pet’s name and photo. Service – A short funeral can go a long way to providing closure for you and your family. Allow family members, including children, to tell stories and share memories or photos. You can also light candles, sing songs, read poems, and give your pet a final goodbye. If backyard burial is not an option, and you still want to memorialize your pet at home, ask your veterinarian about cremation. It’s not as expensive as you may think; prices run between $30 and $250 for most animals, depending on their size and cremation method. Once cremated, you can bury, spread, or keep the ashes right at home. If you decide to have your pet cremated after they pass, you can choose from three methods: communal, individual, or private. Your choice will decide whether your pet is cremated alone or with other animals, and it will determine whether you get to keep the remains. While no method is better than the other, price points do vary. Communal – Multiple pets are cremated together, and the ashes are combined and disposed of or scattered off-site. This is the least expensive option, but you will not get to keep the remains. Instead, the crematory will dispose of them. Individual – Multiple animals are cremated together, but the ashes are kept separate so they can be returned to the pet’s family. This semi-private cremation falls in the middle of the price range. Some mixing of remains may occur, but the crematory will return your loved one’s ashes to you. Private – This method costs more than the others because your pet will be the only one in the cremation chamber. There is little chance the cremains will be mixed with another pet’s before they are returned to you. Once you receive the ashes, you may keep them in a decorative urn or keepsake box somewhere in your home. There is even jewelry you can buy that will allow you to carry some of your pet’s ashes with you everywhere you go. If you plan to scatter your pet’s ashes immediately or any time in the future, be sure to purchase an urn that can be reopened. If the ashes of your beloved pet will remain on your mantle or elsewhere in your home, there aren’t many legal issues to consider. However, if you would like to honor your pet by scattering the ashes there are some things you need to know. From casting the ashes into the wind or water to burying them in the earth, how you choose to scatter your beloved pet’s ashes is a personal one. No matter which method you choose, you’ll have to follow the regulations at the national, state, and local levels. Contact your local mortuary board, environmental agency, or health agency to determine the laws in your area. Private property – Whether it’s your property or someone else’s, as long as you have permission, you can scatter the ashes anywhere you choose. Do not attempt to secretly spread ashes on privately-owned land without permission because it is against the law. Public property – Know your property lines, especially if your property borders public parks or uninhabited public land. To scatter on public property, you will need permission and/or a permit. You will also have to avoid environmentally-sensitive areas. Bodies of water – Depending on your state, it may be illegal to scatter your pet’s ashes in a pond, river, or lake. Even if the body of water is on your private property, you should check with local officials first. To scatter pet cremains in the ocean, you need a special permit from the Environmental Protection Agency (EPA). If you’ve just lost your best friend, the last thing you want to worry about is the legalities and logistics of burying or cremating them. Unfortunately, it’s a necessary part of loss. It may help a little to remember that when you create a memorial for your pet at home, you are honoring the relationship you shared in life.